This article first appeared in Personal Wealth, The Edge Malaysia Weekly, on November 19, 2018 - November 25, 2018. For Sarah Chen, co-founder and managing partner of The Billion Dollar Fund for Women, the case for investing in companies with females on the founding team is a strong one. Various studies have highlighted that gender diversity in founding teams contributes to profitability and that the female market is booming. “I really hate to put female founders into a community or social lens because they do not belong there. This is a clear business game,” says Chen. The definition of a female founder is a female in a C-suite position who has influence in driving the company. Some venture capital funds have discovered that a founding team’s diversity has an impact on its bottom line. For instance, in 2015, US-based First Round Capital examined 300 start-ups in its portfolio for the past 10 years and learnt that teams with at least one female founder outperformed the all-male teams. “Teams with just one female founder in a C-level position outperformed all-male teams by 63% in terms of returns,” says Chen. A June report by the Boston Consulting Group revealed that for every dollar of funding, founding teams with at least one female generated 78 US cents in returns compared with all-male teams, which generated less than half of that. Despite this, they received less than half the funding of all-male teams. A PitchBook research report points out that only 2.2% of venture capital funding in 2017 went to solely female founders and 15% to founding teams with at least one female. That is why Chen and co-founder Shelly Porges, managing director of advisory firm Reservoir Q Global, set up The Billion Dollar Fund for Women, which was launched in October. They aim to tackle the gender funding gap by getting venture capitalists (VCs) to commit to the goal of investing in female founders. The VCs who have pledged to contribute to the fund include Gobi Partners, Golden Gate Ventures and Rethink Impact. As at Nov 5, it had raised US$500 million from at least 24 VCs, who are listed on its website. “Rather than playing the small game of just being one fund [investing in female entrepreneurs], we wanted to catalyse all the funds globally. We are growing our niche to become that voice for global funders of women,” says Chen. The fund’s initial goal was to raise US$100 million by 2020, but that was quickly surpassed. Now, the founders are confident of reaching US$1 billion by 2019. Chen is a Malaysian living in the US. Apart from her involvement in the fund, she is chief strategy officer of US-based technology company Bloxed. Prior to this, she was co-founder of Lean In Malaysia and a member of Sime Darby Bhd’s venture capital and innovation strategy team for four years. Chen has identified a few key challenges faced by female founders. Traditional expectations of a woman’s role in the family, for instance, have caused some to give up their careers for marriage or to prioritise family matters over work. The relative lack of women in leadership positions also leads to an unconscious bias that women are just not suited to these roles. “The second challenge is with regards to network. Even within the corporate setting, all-boys clubs still exist when the guys go outside and smoke [for instance] and that is when the deals are made,” says Chen. She brings up her own experience while working in corporate venture capital. Once, when she was leading discussions in a deal with Japanese counterparts, she was suddenly told to allow someone else to take over. “I think this is because men [in Japan] are not used to strong women. Over there, women are expected to be more submissive and subservient,” says Chen. Another challenge is the lack of access to capital, which is tied to the founder’s network. “You need to know someone who is willing to write you that cheque. How do you build that? You need to be in that network. You need to go to that all-boys school,” she says. Most of the funding, however, still goes to Silicon Valley. There is no shortage of start-ups with female founders, even in Asia, says Chen. She points to Lucy Peng, former executive and co-founder [with Jack Ma] of Ant Financial Services, as an example. The US$14 billion Series C funding for Ant Financial earlier this year bumped up the amount of venture funding that went to female founders in the second quarter of this year by 13 percentage points, according to Crunchbase. “The funding that goes to female founders in Asia is similar to the global number, which is 13%. The Series C funding that came through for Ant Financial tipped the scales for the region,” says Chen. The gender funding gap has been recognised as a problem globally. There are female-focused funds set up in response such as Ellevest, Built By Girls Ventures and Female Founders Fund. 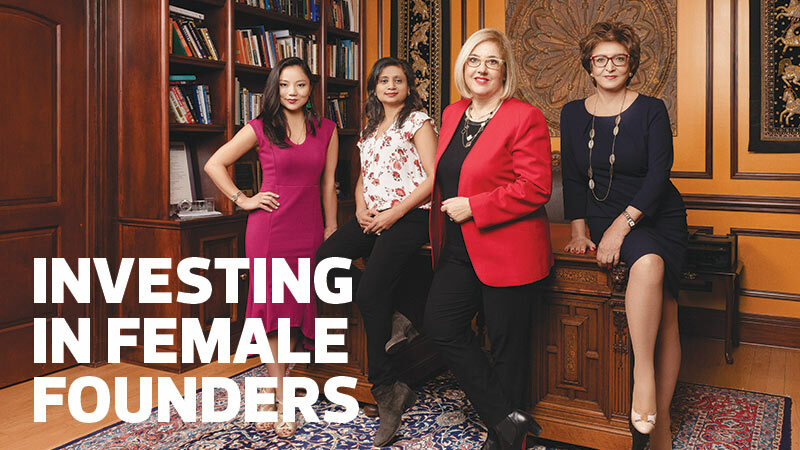 Gender lens investing is another concept that has emerged to help investors include diversity in their portfolios. “Is your founding team diverse? Are your supply chain, customers and sourcing diverse? In terms of the market, it could be an all-male team, but they invest in women,” says Chen. The Billion Dollar Fund encourages the VCs who pledge to include female founders in their deal flow and highlight it to their investment committees. “We are asking them to do a few things. One is to ensure they increase their investments in women entrepreneurs,” says Chen. The VCs are also encouraged to provide constructive feedback to companies with female founders in which they decline to invest. This is to ensure that the investors examine their reasons for the rejection and eliminate any form of bias. “One of the truths about funding is that the investor must take some level of risk by guessing. In seed funding, you [the founder] have no revenue or traction. You only have your team and an idea. What am I [the investor] backing? I am backing you [the founder]. Many times, some people have no real structured methodology or systematic framework to evaluate the start-ups and provide feedback. That is how all the [biased] patterns come about,” says Chen. This unconscious bias could come from the partners or investors identifying with a start-up founder because of their common experiences. In this case, the majority of VC partners are male, according to Pitchbook. “Sometimes, they see a younger version of themselves and they want the founders to succeed,” says Chen, adding that those whom they do not identify with (albeit unconsciously) will not get ahead.